Wet felting transforms fluffy wisps of wool fibers into a durable, insulating textile. 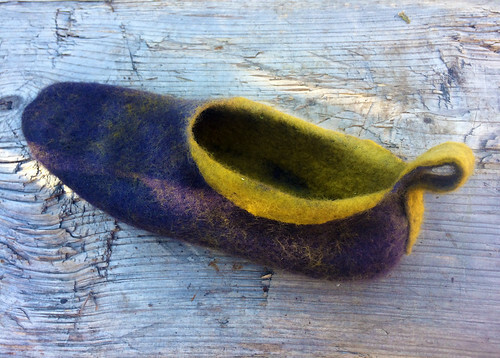 In this workshop we will use the process of wet felting to make a pair of slippers: a perfect gift for a friend (or your own feet). After we finish the design phase, prepare for an arm workout, some splashing, and some miraculous shrinking: each slipper will be reduced by a third as it becomes felt. No experience required. Aprons provided; please bring a towel and lunch.